Playing against World Cup player doesn’t happen often to Oceania players, however, Solomon Islands international Micah Lea’alafa is living his childhood dream to share the same pitch with some of football’s world stars in the form of Spain World Cup winner Fenardo Torres and former Manchester United midfielder Marone Fellani. 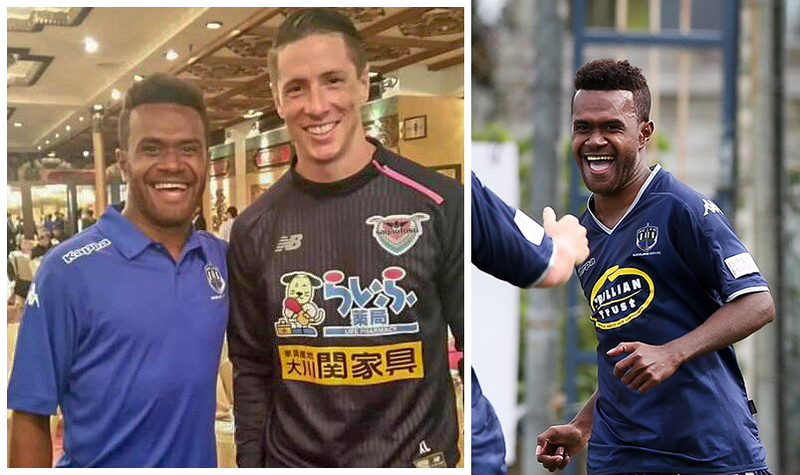 Lea’alafa is in Hong Kong this week as Auckland City set to take on Chinese Super League gaints Shandong Luneng Taishan FC today at Hong Kong’s Tonghai Financial Chinese New Year Cup. According to Auckland City media, The Chinese Super League giants boast a squad of top quality talent led by 1.94m former Italy striker Grazione Pelle and recent acquisition Marouane Fellaini, picked up in the January transfer window from Manchester United. Former Brazil international defender Gil completes a trio of players with world class pedigree and like his team-mates, he’s a giant standing at 1.93m. Speaking from Hong Kong, Lea’alafa says he is enjoying every moment with his fellow Navy Blues team mates ahead of the clash with Fellaini and Co.
Lea’alafa stressed the Chinese New Year Cup is good build up for his Auckland City side who will coming to Honiara this month for the OFC Champions League Group D in Honiara. “It’s a good build up games for us especially with the OFC tournament is just around the corner. So yeah I’m really excited,” he stated. The Solomon Islands international officially met Torres at the welcoming ceremony. Lea’alafa has been at three FIFA Club World Cups with the Navy Blues and is used to rubbing shoulders with the occasional big name opponent but Torres was another level. “Fernando Torres was a legend at Liverpool and for Spain and it’s a great experience to meet a player of his stature in the game. “We’ve been welcomed warmly by tournament organisers and we want to represent ourselves, the club and New Zealand to the highest standard we can,” Lea’alafa added. AC (squad): 1. Enaut ZUBIKARAI (GK), 3. Takuya IWATA, 4. Mario BILEN, 5. Angel BERLANGA (c), 6. Brian KALTACK, 7. Cam HOWIESON, 8. Albert RIERA, 9. Javier LOPEZ, 10. Micah LEA’ALAFA, 11. Fabrizio TAVANO, 12. Dylan MANICKUM, 13. Patrick LUNDEMO, 14. Jordan VALE, 15. Dan MORGAN, 16. Yousif ALI, 17. Jackson WOOD, 18. Ruben PARKER (GK), 19. David BROWNE, 20. Te Atawhai HUDSON-WIHONGI, 21. Maro BONSU-MARO, 22. Omar GUARDIOLA, 23. Alfie ROGERS, 24. Cameron BROWN (GK), 25. Joshua JONES.